We know that not every phone released has an awesome camera, as not every company has the resources to throw in huge sensors to bump the price of their products. Sony’s answer to the problem is to let everyone take advantage of their camera technology via the QX-line of detachable smartphone lenses. Last year, they released the QX-100 and QX-10 lens, which are attachable to almost any smartphone that is currently available for purchase. Via WiFi and NFC, the smartphone and the lens communicate to each other, with the smartphone acting as the lens’ viewfinder. The device features a 18.9MP sensor, 10x optical zoom, OIS, Sony’s BIONZ image processor, and weighs in at just 3.17 ounces. 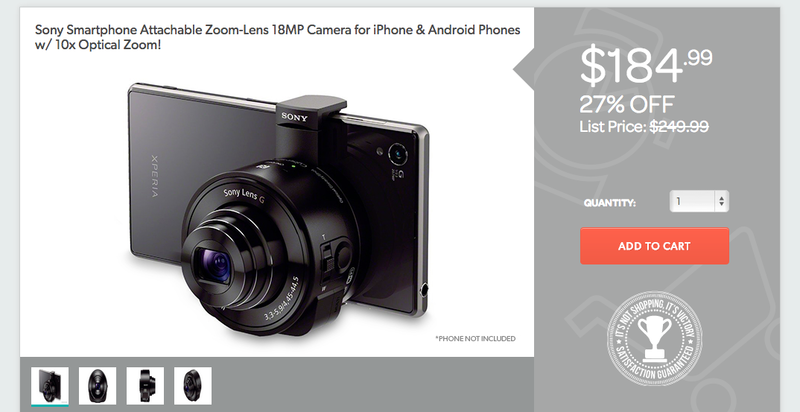 Today, for a limited time on 1sale.com, you can pick up Sony’s QX-10 model for just $184.99, 27% lower than the list price of $249.99 on Amazon. While the QX-10 doesn’t have as many features as its big brother the QX-100 (retailing for nearly $500), it’s still a good way to beef up your phone’s photography output. Better yet, the units are brand new from factory, and also come with a 1 year warranty. No refurbished janky nonsense to be seen here. Follow the via link below to check out the deal.